14 July 2009: Broken links on the sites about "Forestry in Germany" were removed or updated. 25 May - 6 June 2009: Together with his colleague Dittmar Siebert from the Holzfachschule Dr. Kürsten visited Rwanda for an identification mission funded by GTZ-project "Promotion of Economic Development and Employment". The aim of this mission was to start sector study for wood and metal working companies to analyse its constraints and perspectives. 05 January 2009: Dr. Kürsten started his new job as as "Network Manager Timber Trade" at the Holzfachschule Bad Wildungen. 06 July 2008: A new site on "Forestry and wood use projects for climate change mitigation" and a publication related to this topic was uploaded and the list of publications updated. 18 June 2008: Dr. Kürsten gave a presentation on "Bioenergy use in India - Actual trends and developments" in course of the PhD-Programme "Wood Biology and Technology" at the University of Göttingen. 5 - 9 May 2008: Dr. Kürsten visited the IFAT in Munich. See special report on water management. 28 April / 1 May 2008: New publications were added and the most intensively visited page on Environmental Studies in Germany was improved. 23 March 2008: The first announcement on the Conference on Gender and Forestry (November 16th till November 19th 2008 at FRI in Dehradun/India) was launched. Dr. Kürsten is acting as the local organiser for the IUFRO Unit 6.08.02 – Education, gender and forestry. 29 December 2007: Many pages modified and added. 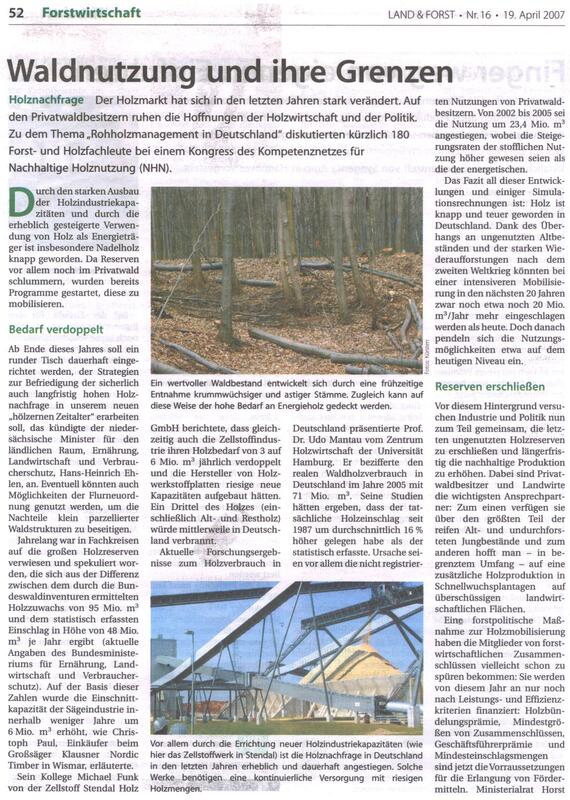 New information on Forestry in Germany. 14 June 2007: After his arrival in India Dr. Kürsten gave a presentation on "Forestry and wood use projects for climate change mitigation" to students and staff of the TERI-University. He explained his former research work in this field (see publications!) 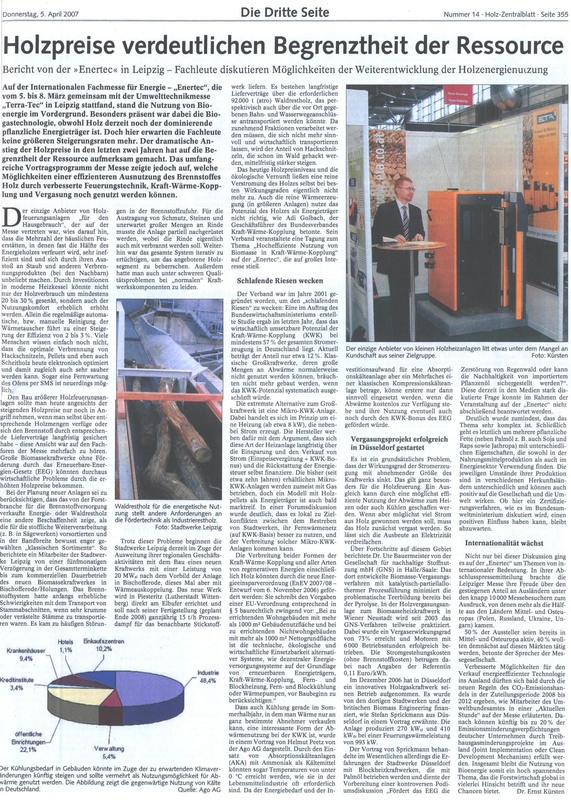 and reported about his latest impressions from the CARBON EXPO in Cologne (2-5 May, 2007) and an "International conference on wood-based bioenergy" in Hannover/Germany (17-19 May, 2007) jointly organised by ITTO, FAO and the German Ministry of Economics and Technology. This conference was held in conjunction with LIGNA+ 2007. 7 June 2007: Page Environmental Studies in Germany lauched and Knowledge Overview modified. 04 Apr. 2007: On the page Lesser known options for the use of sawings and sawdust a new paragraph on the possibilities of using wood residues for soil amelioration was added. 21 Febr. 2007: New pages on the options to use small-diameter logs and on "Journals and internet sources on wood science and technology"
18 Febr. 2007: Information on "Lesser known options for the use of sawings and sawdust" replenished. 13 Febr. 2007: Website newly designed and uploaded!